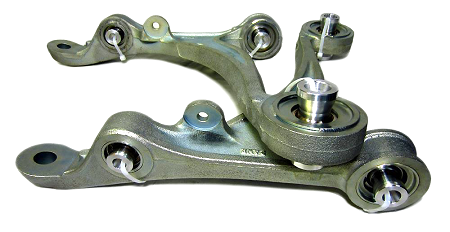 Each and every sleeve and bearing is blueprinted to each specific control arm bore. This level of quality and craftsmanship requires state of the art equipment and ad hoc manufacturing approach. Consequently, these are highly cumbersome and costly to build. In order to maintain the superior level of quality control, We (Kingpin Machine and BlackTrax Performance), share blueprint and machining specifications in order for BlackTrax to carry out consistent manufacturing results giving you the benefits of longer lasting, durable bearings that will significantly improve stability, additional grip, driver confidence and faster lap times and/or quarter mile times. Disassemble, Shot Peen & Cleaning-Bores are Machined/Honed to Spec. It is true that manufacturing quality products from properly graded, U.S. sourced metal and utilizing the best available U.S. produced bearings is more expensive. But it is not only the right thing to do, it ensures that you are running the safest and best performing parts available on the market. Only Aurora Performance Racing Series and/or the New Hampshire Ball Bearing Racing Series lines of bearings are used. Our no compromise approach extends to material choice as well. We machine our bearing sleeves from 4140 HT (Heat Treated) steel and the vast majority of our spacers from 7075 Aluminum. These materials are more expensive than the standard mild steel and 6061 AL but the superior surface finish, additional strength and hardness are well worth the added expense. 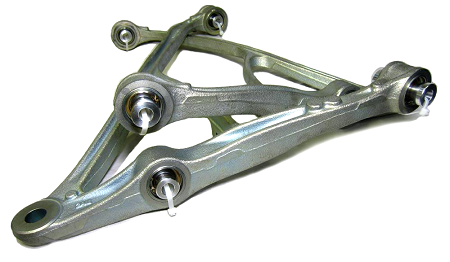 Lack of deflection allows reduced static camber requirements, thus minimizing uneven tire wear and increasing traction. Improved steering feel and precision as steering input is directly translated into wheel movement. Reduction/elimination of dynamic toe change, which along with handling benefits can also provide stability under braking. Elimination of high breakaway torque requirement increases traction; allowing the tire to stay in closer contact with the track surface. All of our parts are designed, machined and tested right here in the United States.